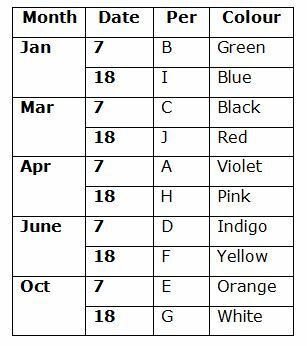 Ten persons A, B, C, D, E, F, G, H, I and J are born in five different months viz., January, March, April, June and October of the same year. 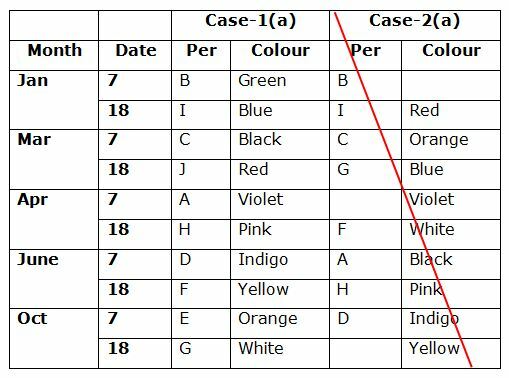 They are all born in two same dates 7th and 18th of the given months and also they likes different colours viz., Violet, Indio, Blue, Green, Yellow, Orange, Red, Pink, White and Black but not necessary in the same order. Only three persons are born between the one who likes Blue and H, who was born in even numbered date but not in the month which has odd numbered days. The one who likes Blue is not the youngest person. The one who likes Indigo was born immediately after H. Only one person was born between C and the one who likes Violet but they are born in consecutive months. C is elder than the one who likes Violet. Two persons are born between the one who likes White and D, who was born in odd numbered date. The one who likes Yellow was born immediately after D. As many persons born before the one who likes Red is same as the persons born after D. I was born immediately after B but born in the same month. Neither B nor I likes White. The one who likes Orange was born immediately before G. Three persons are born between A and the one who likes Orange. More than three persons are born between B and the one who likes Pink. A does not like Pink. As many persons born between the one who likes Violet and F is same as the persons born between H and the one who likes Black. J was born in neither October nor in the odd numbered date. 1. E likes which of the following colours? 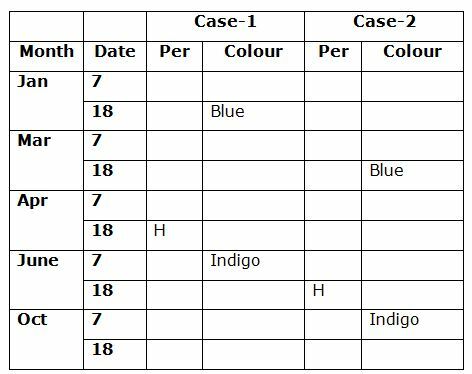 Only three persons are born between the one who likes Blue and H, who was born in even numbered date but not in the month which has odd numbered days. The one who likes Blue is not the youngest person. The one who likes Indigo was born immediately after H.
Only one person was born between C and the one who likes Violet but they are born in consecutive months. C is elder than the one who likes Violet. Two persons are born between the one who likes White and D, who was born in odd numbered date. The one who likes Yellow was born immediately after D. As many persons born before the one who likes Red is same as the persons born after D.
I was born immediately after B but born in the same month. Neither B nor I likes White. The one who likes Orange was born immediately before G. Three persons are born between A and the one who likes Orange. More than three persons are born between B and the one who likes Pink. A does not like Pink. As many persons born between the one who likes Violet and F is same as the persons born between H and the one who likes Black. J was born in neither October nor in the odd numbered date. 2. How many persons are born between F and the one who likes Red? 3. Which of the following combinations is true? 5. If C is related to Violet and D is related to Orange in a certain way. Then, I is related to which of the following? When a number arrangement machine is given an input line number, it arranges them following a particular rule. The following is the illustration of input and re-arrangement. 6. What will be the difference between the elements which is fifth from the right end in Step III and third from the left end in last step? Largest number is moved to the left end and the smallest number is moved to the right end. In the first step, the largest number is divided by 2 and the smallest number is multiplied by 3. In the second step, the largest number is divided by 3 and the smallest number is multiplied by 4 and so on till the last step. 7. How many numbers are repeated in the last step? 8. What is the position of ‘26’ in Step III with respect to ‘56’? 9. What will be the average of the numbers which is first number in first step, second number in second step and so on till the last step? 10. Which of the following numbers will be exactly in between ‘84’ and ‘48.5’ in the Step III? 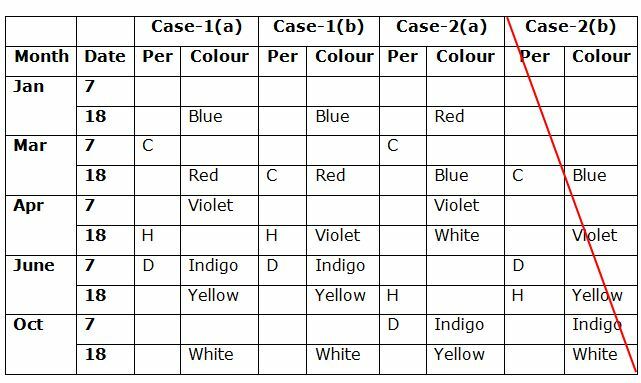 1) E likes which of the following colours? 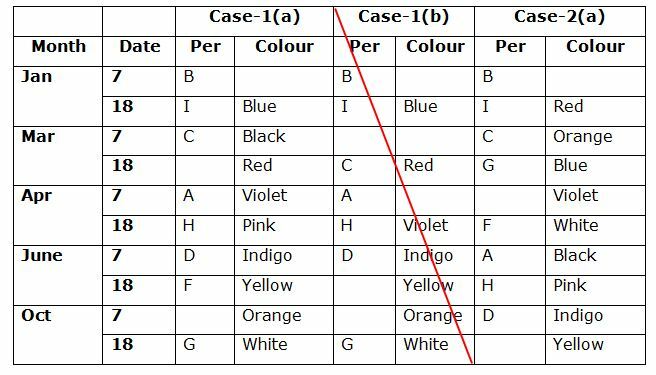 2) How many persons are born between F and the one who likes Red? 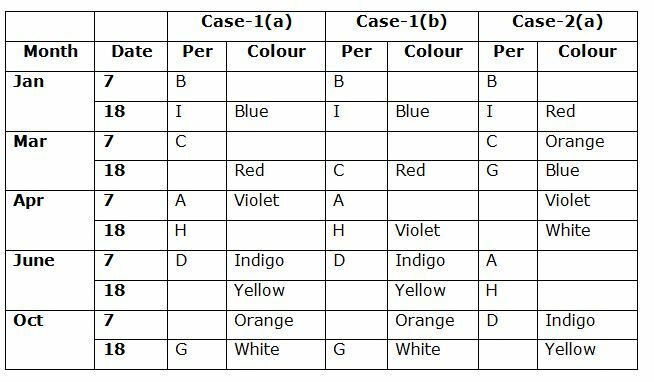 5) If C is related to Violet and D is related to Orange in a certain way. Then, I is related to which of the following? 6) What will be the difference between the elements which is fifth from the right end in Step III and third from the left end in last step? 7) How many numbers are repeated in the last step? 8) What is the position of ‘26’ in Step III with respect to ‘56’? 9) What will be the average of the numbers which is first number in first step, second number in second step and so on till the last step? 10) Which of the following numbers will be exactly in between ‘84’ and ‘48.5’ in the Step III?